Start off your visit on the 1st (Tue): take in the architecture and atmosphere at Holy Trinity Church in Phuket, then head outdoors with Nai Thon Beach, and then enjoy the sand and surf at Kamala Beach. On the 2nd (Wed), you'll have a packed day of sightseeing: see the interesting displays at Phuket Aquarium and then see the interesting displays at Phuket Trickeye Museum. To see photos, other places to visit, traveler tips, and tourist information, read our Phuket Town trip itinerery planner. If you are flying in from Australia, the closest major airport is Phuket International Airport. In November, plan for daily highs up to 37°C, and evening lows to 27°C. Cap off your sightseeing on the 2nd (Wed) early enough to travel to Ao Phang Nga National Park. A rugged and varied coastal environment characterizes Ao Phang Nga National Park. 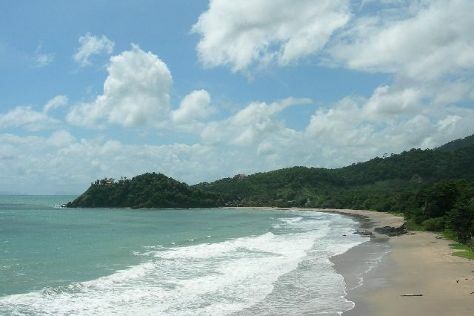 Get outdoors at Bangsak Beach and Natai Beach. Change things up with these side-trips from Ao Phang Nga National Park: Wat Bang Riang (in Thap Put) and Turtle Conservation Center (in Thai Mueang). The adventure continues: admire the sheer force of Raman Waterfall Forest Park and head off the coast to Panak Island. To find other places to visit, traveler tips, where to stay, and other tourist information, you can read our Ao Phang Nga National Park trip itinerery planner. Use the Route module to find suitable travel options from Phuket Town to Ao Phang Nga National Park. November in Ao Phang Nga National Park sees daily highs of 36°C and lows of 28°C at night. Finish your sightseeing early on the 5th (Sat) so you can travel to Ko Yao Noi. In a dramatic archipelago of rocky islands in Phang Nga Bay, Ko Yao Noi strikes the perfect balance between settled and unspoiled. Start off your visit on the 6th (Sun): step off the mainland to explore Koh Nok Island. To see where to stay, ratings, and more tourist information, refer to the Ko Yao Noi custom trip planner. The Route module can help you plan travel from Ao Phang Nga National Park to Ko Yao Noi. In November, daily temperatures in Ko Yao Noi can reach 37°C, while at night they dip to 27°C. Wrap up your sightseeing by early afternoon on the 6th (Sun) to allow time for travel to Krabi Town. On the 7th (Mon), enjoy the sand and surf at Phra Nang Beach and then get reinvigorated at Marina Yoga & Reiki. Here are some ideas for day two: look for gifts at Alex Fashion Way, see the vivid underwater world at Ko Lao La Ding, and then kick back and relax at Fossil Shell Beach. To find reviews, traveler tips, photos, and more tourist information, read Krabi Town online itinerary creator. Use the Route module to find suitable travel options from Ko Yao Noi to Krabi Town. In November, daily temperatures in Krabi Town can reach 36°C, while at night they dip to 27°C. Finish your sightseeing early on the 8th (Tue) so you can ride a ferry to Ko Phi Phi Don. 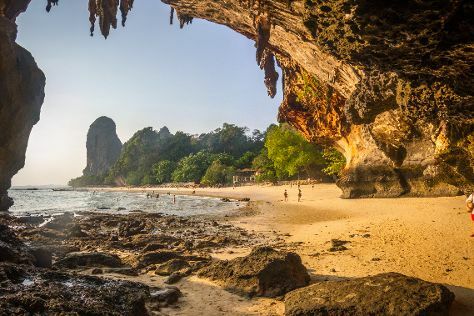 On the 9th (Wed), enjoy the sand and surf at Loh Da Lum Bay, get reinvigorated at Keiritas Yoga, and then explore the fascinating underground world of Viking Cave. Keep things going the next day: contemplate the waterfront views at Laem Tong Bay and then enjoy the sand and surf at Loh Moo Dee Beach. For reviews, more things to do, ratings, and other tourist information, use the Ko Phi Phi Don vacation planner. Traveling by ferry from Krabi Town to Ko Phi Phi Don takes 1.5 hours. In November in Ko Phi Phi Don, expect temperatures between 36°C during the day and 27°C at night. Cap off your sightseeing on the 10th (Thu) early enough to travel to Ko Lanta. Kick off your visit on the 11th (Fri): head outdoors with Klong Dao Watersports, then enjoy the sand and surf at Nui Beach (Haad Nui), and then appreciate the extensive heritage of Lanta Old Town. Here are some ideas for day two: stroll through Kantiang Bay. To see maps, ratings, reviews, and other tourist information, read our Ko Lanta vacation trip planner. Traveling by ferry from Ko Phi Phi Don to Ko Lanta takes 1.5 hours. In November, plan for daily highs up to 36°C, and evening lows to 27°C. Finish up your sightseeing early on the 12th (Sat) so you can travel to Ko Libong. To see photos, traveler tips, and more tourist information, read Ko Libong sightseeing planner. The Route module can help you plan travel from Ko Lanta to Ko Libong. Expect a daytime high around 36°C in November, and nighttime lows around 28°C. On the 13th (Sun), you're off toChiang Mai. Take a break from the city and head to Elephant Jungle Sanctuary and Chiangmai Highlands Golf Course. 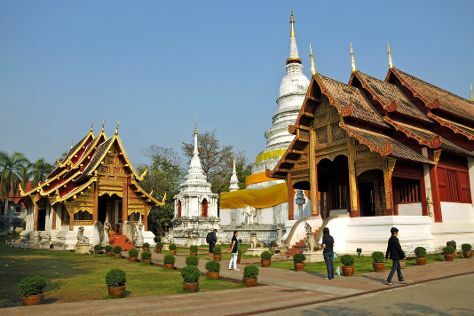 Step off the beaten path and head to Art in Paradise, Chiang Mai 3D Art Museum and Wat Suan Dok. There's much more to do: steep yourself in history at Wat Phra That Doi Kham (Temple of the Golden Mountain), look for all kinds of wild species at Elephant Retirement Park, admire the landmark architecture of Chiang Mai Women's Correctional Institution, and deepen your understanding at Three-Generation Golf Academy. To see other places to visit, more things to do, maps, and other tourist information, refer to the Chiang Mai trip itinerery planner. You can fly from Ko Lanta to Chiang Mai in 3.5 hours. Alternatively, you can do a combination of bus and ferry; or do a combination of car and car ferry. Traveling from Ko Lanta in November, plan for a bit cooler nights in Chiang Mai, with lows around 22°C.